Celiac Baby! : Cookbook of the Month Review January 2014: Sweet Debbie's Organic Treats & A Winner! Cookbook of the Month Review January 2014: Sweet Debbie's Organic Treats & A Winner! Are you saying "no" to dessert because of food allergies or health concerns? Or saying "no" when your kid asks for a cupcake at a birthday party? If so, Sweet Debbie has a Chocoholic Cupcake for you. With her own son allergic to "every food in the USDA pyramid," Debbie Adler took matters into her own kitchen. 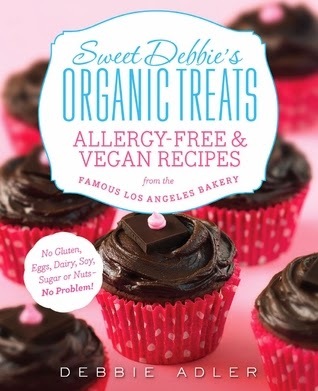 Today, her wildly popular, allergen-free bakery, Sweet Debbie's Organic Cupcakes, has Hollywood's A-list celebrities lining up for her delicious, nutritious muffins, brownies, cookies, cupcakes, donut holes and breads. If you're a vegan, diabetic, have Celiac disease, a food allergy or an intolerance, or are simply interested in boosting your health via your baking tins, set the oven to "preheat" and sit down with "Sweet Debbie's Organic Treats." Your sweet tooth will thank you for it. This cookbook was a hit in my house because most of the recipes are created with kids in mind. I will admit that I didn't always buy all organic ingredients, but it was nice creating treats my kids would eat that didn't have any refined sugar in them. Everything was gluten free (of course), egg free, and dairy free as well. This book has a good selection of recipes, from breakfast bars and muffins to recipes for traditional sweets like chocolate chip cookies, cupcakes, and brownies. The photography in this book was incredible, really giving me an idea of what the finished product should look like. This is important in a cookbook like this one, when baking with some ingredients that I'm not overly familiar with. While I did have to purchase some items I' m not used to buying (like guar gum, I usually just use xanthan gum), the ingredient lists for the recipes weren't extremely long or overwhelming. Baking is supposed to be fun, not a chore. Overall I liked this cookbook. The recipes turned out great, and it's nice to have some healthier alternatives to turn to when baking. Now, on to the exciting part of the post. We have a winner! Thank you to everyone who entered to win a copy of this month's cookbook. If you didn't win, remember that there will be another cookbook up for grabs when I announce February's cookbook of the month. The winner is Deb D.! Please check your email for more information.